We spotted a beautiful bi-colored Bouganvilla “Surprise” (Mary Palmer), which had clear pink-white flowers at Kalbu Park. Thank you Mary for hosting Mosaic Monday.Do check out more mosaics at Little Red House Enjoy and have a great Monday! Bouganvilla is one of my favorite flowers. It amazes me how many different colors it can be. This is such a beautiful variety. And the subject in the center is darling! Beautiful mosaic, Shantana. And your son is just precious!!!! These are beautiful! I have not seen this pink and white combination. Oh, I love your dragonfly post. They are so elusive and I can't capture them at the right time and moment. Oh wow! Diya looks as cute as ever! She'll soon be taking great shots! And the blooms are so delicate-looking and beautiful. Happy Mosaic Monday! Hi Shantana, I think this is my favorite mosaic so far. 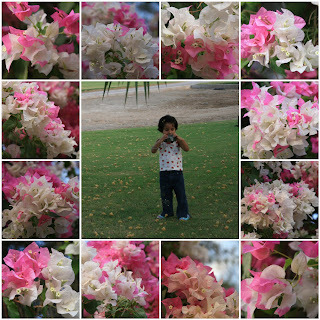 Diya is a beautiful little girl and the colorful blooms surrounding her are so feminine and delicate. She must love going to the park. I hope you have a wonderful week. The mosaic is beautiful! Wonderful shots, and Diya is adorable. She looks like she's having fun. That is a really beautiful mosaic. And thanks for visiting my blog. What beautiful blossoms! And your little blossom in the center most beautiful of all. lovely! i dont think ive seen this combination of colours on them before. Your little one is just precious. She looked like she was really concentrating hard. Lovely mosaic-especially your sweet daughter. Loved looking through all of your photos, very beautiful. Marvelous mosaic! Your daughter is adorable. Hello, your bi-colored blooms are so gorgeous and Diya is adorable and looks like she definitely has the photograph taking gene :-), happy Mosaic Monday, Kathy. What a beautiful mosaic you created. And your daughter is darling too! Beautiful flowers, and a lovely mosaic. Got your daughter starting early with the camera ;) You'll have to post some of her shots soon. I'm looking forward to Diya's first post! Fantastic pink combination, and your girl is adorable ;) Nice mosaic !! Very sweet, this would look so nice framed. I loved to give my children a camera when they were small too, the world through their eyes was always facinating!